It was the voice of a novice monk with a shy smile and warm eyes. The Mandalay Hill is a popular place among tourists for watching the sunset, and among monks for meeting tourists. I was the tourist of choice for Sai and his friend. We covered the basics like “where I am from” and “how I’m enjoying Myanmar” and then found out that he was 17 and has been living in monasteries for the last 11 years. He left home when he was 6 so that he could attend a monastic school and get an education. That’s just texts he has for the tourists, I thought at first. But somehow, the conversation kept going back to how much he wants to learn English and be in high school (he was in middle school) and complete his education. The dream would be to study abroad (India or maybe Sri Lanka, where there are important Buddhists centers) but that would be too expensive for him. I asked him and his friend to allow me to take them for lunch. Lunch is their last meal of the day as they are not allowed to eat after noon. They invited me to visit the monastic school and we would eat in the area. 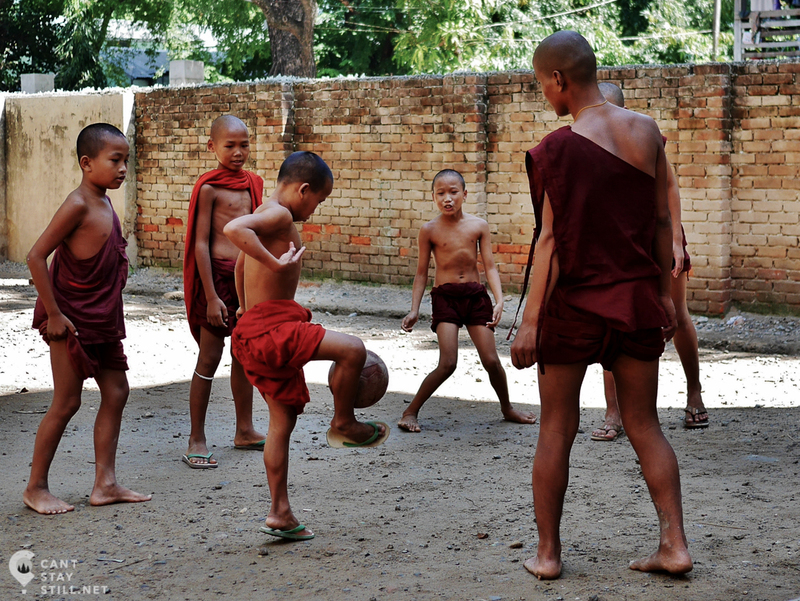 Monastic schools are the most common form of education in Burma. They are religious institutions attached to the Monastery and they provide board and schooling for the next generation of monks. Yes, Sai does want to be a monk (he can become one when he’s 20, till then he will be a novice) but he doesn’t know for sure if it will be for all his life. His brother had to quit when his family was depending on him as the sole breadwinner. As one would expect from a “boarding school”, some kids were playing, others were in the classroom, some were gathered around a laptop, watching a movie. In the yard, a group was playing ball, a couple of young ones were fighting, others were going about their day curious why a white girl is on the premise. But the similarities stop there. The ball the kids had was ripped and stuffed with old clothes. Each bedroom sleeps around 50 novices in one room on large wooden benches where each student had his (non-padded) mat. Students are responsible for their own laundry and for receiving the breakfast donations. Some days that’s an easy job, some days it means hours of walking barefoot in the rain. Sai has been living with other novice monks in monastic schools attached to monasteries since he was 6 and, in the last 5 years, he’d seen his family twice. He’s missed milestones in his brothers’ lives and I could see the worry in his eyes when he told me that one of his friends couldn’t make it to his mother’s funeral. After being shown around the school, Sai we went to eat. They chose a place right across the street, a cheap street eatery where neither Sai or his friend had eaten before. I had to insist for them to have some soft drink and choose whatever they like to eat. The meal for the 3 of us was about 2USD and they had a guilty look on their face when I paid the bill. So there I was, hoping to offer them something that would get them excited or they wanted but couldn’t afford and all I could get out of them was “notebooks for school”. Ok, notebooks it is. Again guilty looks when they told me the price of the 12-notebook pack. “Just get one pack and we’ll share. it’s enough”. “No, we already have those, you really shouldn’t bother”. The above happened right before a long night bus ride. I used that time to think about how much I valued my education when I was in school (I didn’t). How I would go about not seeing my family for five years and how that would have felt for me as a child. How adulthood comes at a painful age for some and the only difference between us (me and you, reading this) and them (adult-children) is the family we were born in. But Sai is a happy story of a young human who lives life with a sincere smile and who works diligently to reach his goals. He has an inner richness that seems unattainable for some of us and he has the power to change perspectives, as he did with mine.